To properly assess Adrift, the latest lost in the wild adventure, it would seem the most logical thing to do is compare it to that of the wave of recent films with similar premises and or ideas with the main objective being to determine whether or not it does anything different or at least attempts to bring new ideas or layers to the experience. While Adrift doesn’t necessarily add anything new to the genre or say anything that hasn’t been said before it does stand to reason that no matter how similar the circumstances included in these stories of desperation and survival tend to be one is typically as harrowing as the next and, if executed in an effective enough fashion, will still hit all the necessary marks and retain enough suspense to be both entertaining as well as eye-opening. If Adrift is anything it is effective in its execution; this likely has to do with director Baltasar Kormákur's (2 Guns, Everest) experience in bringing these true to life, but often times gruesomely heartbreaking events to life in an honest, but completely cinematic fashion. Kormákur takes this based on actual events story (as most of these are) and intertwines the survival narrative with that of a blossoming love affair between two young/beautiful people that are unaware how much their wills and fresh love are about to be tested. As corny as that may sound or as cheap as that storytelling trick may seem, Kormákur somehow manages to pull it off with a certain level of credibility that lends the familiar beats a sense of urgency which is good as, if one is clued in at all, they will be able to see the plot devices at work. This potentially undercuts what Kormákur and screenwriting team the Kandell brothers (Jordan and Aaron) are counting on as the emotional anchor (pun totally intended) they pull out from under the audience at the beginning of the third act. 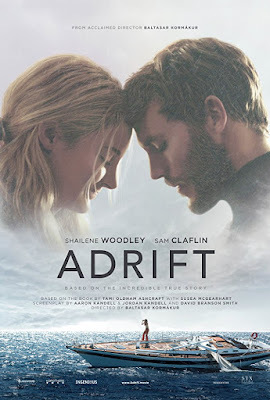 Fortunately, Adrift still works no matter your disposition thus leaving the overall impression the film leaves to once again rely on how effectively what we as an audience have been trained to know is coming is conveyed. In the tradition of films where people are stranded and left to contemplate the meaning of their now-seeming small existence in relation to the expanded world around them Adrift ranks somewhere a bit below Life of Pi and a fair amount above that of last year’s The Mountain Between Us. Tami (Shailene Woodley) and Richard (Sam Claflin) meet in Tahiti and form a whirlwind romance of sorts. Photo by Kirsty Griffin/Courtesy of STXfilms - © Motion Picture Artwork 2017 STX Financing, LLC. All Rights Reserved. 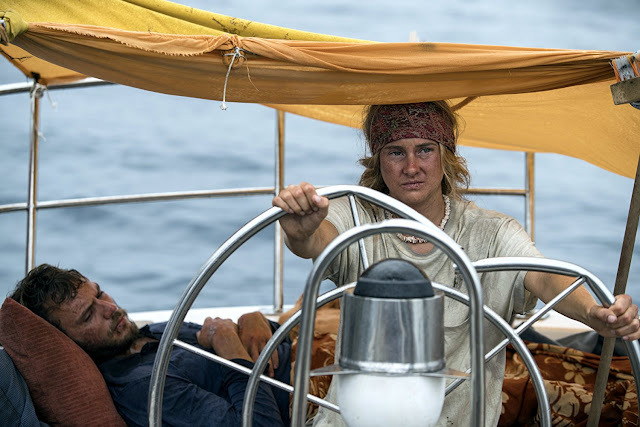 It is 1983 and twenty-four year old Tami Oldham (Shailene Woodley) has just arrived in Tahiti where her last gig as a cook on a schooner brought her. Tami has no particular plans and seemingly little ambition other than to stay as far away from San Diego, California, otherwise known as home, as long as she possibly can. It seems as if Tami has been following this pattern for quite some time-picking up odd jobs wherever her sailing gigs happen to take her. It is in Tahiti though, that things take a turn for the interesting when Richard (The Hunger Games franchise's Sam Claflin), a former naval academy student who has built his own boat and sailed half way around the world on his own, shows up and sweeps Tami off her feet, for lack of a better expression. The thing about Adrift though, is that we don't learn all of these details in chronological order, but rather Jordan and Aaron Kandell, along with David Branson Smith (Ingrid Goes West), have taken Oldham's 1998 debut novel, "Red Sky in Mourning: The True Story of a Woman's Courage and Survival at Sea", and very precisely plotted it out so as to make the survival sections of the film merge with the flashbacks that reveal how Tami and Richard met and fell in love in a very specific way that, even if you've read the source material or are familiar with the real life story, there are a certain amount of stakes you're able to get caught up in. The script layers in the details of Tami and Richard's relationship so as to make the moments in which we see the couple in deep desperation as they are stranded in the middle of the ocean that much more meaningful. Whether this be that Tami is a vegetarian, that she's only picked up a few lessons on how to sail from her previous jobs, or that she is generally a free spirit who is, "fearless like a bloke," as Richard says, it is these details we see exemplified in individual flashbacks that directly contribute to the inevitable scenario that Tami has to deal with on her broken and stranded boat while battling mental exhaustion and physical debilitation. This technique that was formerly referred to as being something of a storytelling trick actually comes to be something of its saving grace given how much it would have felt the movie were spinning its wheels were it to simply stay with Tami and Richard throughout the forty-one days the characters are stranded on the boat. This alternate approach makes the storytelling both an interesting way to provide variety and increase investment while at the same time exercising a practical way in which to convey the story that, while at first feels rote, comes to be a technique that crescendos with the intended emotional significance and essentially solidifies Adrift's place as both a well-executed and moving entry in the genre. And while both the Kandell's screenplay and Kormákur's measured direction lend the film more of a subtle weight than expected there is much credit to be given to the actors on screen as well, primarily Woodley, who has to do the majority of the heavy lifting given Claflin's Richard is injured and bound to a single position for much of the runtime. From the onset of the film it is easy to see why Woodley was attracted to both the character and the material as Tami is very much a free spirit a la very much in line with Woodley's seeming own character, but more than this it seems something about Oldham's story genuinely connected with the actress as not only does Woodley star in the film, but she produced the project as well. To this effect, Woodley throws herself into the role completely and while it is easy to forget the Divergent star is a very raw performer (see The Descendants or The Spectacular Now) rather than just another flavor of the month hot, young actress who stumbled upon her own YA franchise, Woodley really shows up here to give this character her all. As a good portion of the film sees Woodley acting alone with no one else to feed off of or even utilize in convincing the audience of her authenticity, the actress is able to harness this presence she possesses and utilize it to the point we want to stick out this journey with her even if we ourselves can't wait to get away from the circumstances. Claflin, in a less showier role than Woodley, still maintains his own sense of self (he did something similar a few summer's back in Me Before You) as the actor looks appropriately early-eighties in much of Richard's garb while more so he impresses by turning little moments into ones that will completely devastate you in the most rewarding of ways. There is a scene about mid-way through the film where Claflin's character discusses the death of his mother at a young age and how he has come to somewhat internalize this idea of who he believed her to be and how he uses this internalization as a point of guidance. It's a nice, pure, insightful moment that might easily be dismissed or forgotten in the grand scheme of the story, but it is a scene that not only furthers said story, but also doubles as a way to deepen the relationship between Tami and Richard as well as highlight why Tami falls so quickly and so deeply for this man she's only known a few months. This type of believable bond that is revealed after such a short time (which is even more truncated in the film, obviously) is also a testament to Woodley and Claflin's chemistry and the well-constructed screenplay. Tami and Richard rarely allow themselves to become overly irritated with one another despite their circumstances and instead consistently remind themselves of this inherent connection they have that seems to be greater than any problem they come in contact with. Again, everyone seems aware of how corny this all sounds and could come off as, but somehow Adrift and Kormákur make it work at a level that is not only credible, but largely impactful. Tami and Richard's boat is hit by Hurricane Raymond in the fall of 1983 stranding them for 41 days. To be adrift is defined as floating without being either moored or steered. In this film, Tami has to deal with a broken vessel while feeling like one herself and to be determined enough to find direction and steer one's self out of the headspace and the scenario itself is something the film does surprisingly well. It would be no surprise to state that, going into Adrift, there wasn't much in the way of expectation and while this may ultimately give the film an edge this is a film that knows what it is and takes the tropes and clichés of these kinds of films and uses them to its advantage by not only chronicling these moments in ways that continue to deepen our sympathy for the characters, but also quietly speaking to some of the larger themes at play. That being said, Adrift isn't venturing to say much beyond the obvious, but what it does tackle it tackles well. For example, in one of the first discussions between Tami and Richard, Richard talks about his love/hate relationship with sailing and how there really isn't much good about it in terms of the work versus reward, but he does pause a moment when reflecting on those times-days into a voyage-when the infinite horizon before him becomes an incomparable intensity that swells within him. Now, this is quickly dismissed as being corny by Richard himself, but Tami gets it and is very much in tune with recognizing the role we as humans play in our environment and how she admires Richard for having found his when she still feels so lost and so far away from her destiny. Is Adrift necessarily trying to say anything specific about a person's sense of self in a world that is much bigger and more expansive than the individual can even imagine? Probably not, but there are suggestions there if you care to look for them. The same with that of a scene in which Richard proposes to make Tami his girlfriend by telling her that in a certain culture placing a flower behind one ear over another is a sign of being off the market; a flower that moves faster through its life cycle than anything else on earth-blooming and wilting in the same day. Is this foreshadowing? Naturally. Is it some slight symbolism for how the movie makes itself as much about the connection between Richard and Tami as it does the two of them surviving one of the most catastrophic hurricanes in recorded history? Of course. They survive only because of the strength once receives from the other as in one of these stories can't happen without the other and the fact the movie realizes that is what makes it so commendable and so...effective. Sure, it has things it stumbles over-it reiterates things we understand in sometimes blatant fashion-but it is also surprisingly restrained for such a naturally sweeping love story. The cinematography by Robert Richardson (a frequent Tarantino and Scorsese collaborator) is ravishing while Volker Bertelmann's score is there, but never swells to egregious levels. In essence, Adrift does what it is meant to do as effectively as it could which, if you've read the entirety of this review, you know is what matters most.